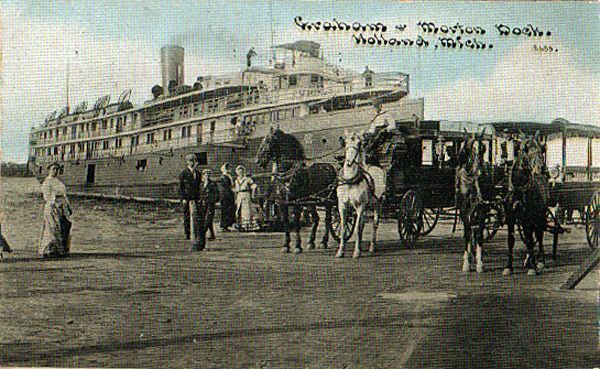 Passenger and freight transportation by steamship to and from Holland, Macatawa Park and Ottawa Beach was very important in the era before good roads and affordable cars and trucks. 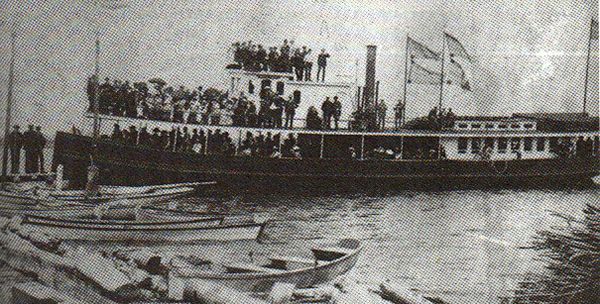 By 1892, more visitors arrived at Ottawa Beach by excursion steam boats from Chicago than came on the trains from west Michigan. 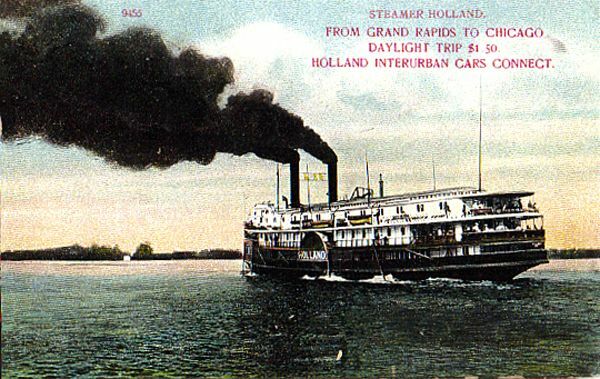 There are numerous postcards showing steamships in action near the two resorts and some of the cards boldly advertise the schedule and fares for the steamers. These were clearly offered for sale at the resorts and on the boats themselves. 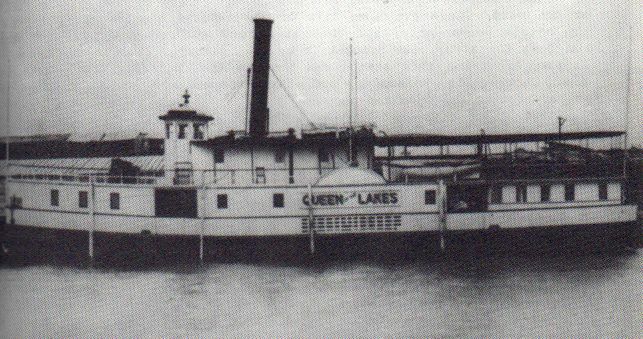 The Chicago and West Michigan Raliway had the Hotel Ottawa but no rail line to the beach, so they arranged to have the steamer Queen of the Lakes under master F.L. Johnson come down to Lake Macatawa from Elk Rapids. Thus two groups each with its own resort area and hotel competed for visitors wanting to get out to the lakeshore. The Chicago and West Michigan railway extension from Holland out to the Hotel Ottawa was completed in 1890, a year which also saw the completion of 28 cottages at Ottawa Beach. Macatawa Park had to wait another eight years until July of 1898 for completion of the electric interurban line which connected Grand Rapids to Ottawa Beach. From its inception, Macatawa Park was very aggressively promoted by the Holland residents who controlled it. Captain Harrington’s steam boat “Macatawa” had an exclusive agreement to transport passengers from his dock on 5th street in Holland to the Macatawa resort on the south side of the channel, and he refused to ferry passengers over to Ottawa Beach, resulting in what hs been called the “Steamboat Wars.” In Holland, Macatawa Park became the lakeshore destination of choice for several years.